Nunn Design continue to go from strength to strength. Just look at their 2017 Winter Collection. They are giving away this fabulous $85 retail package shown below to one lucky winner. As you can see they have new bezels and open frames - the arrowhead and half ovals in particular are uncommon shapes. But my absolute favorite are their geometric bangles. There are actually different styles available in their line-up now. These are perfect for those who like contemporary styles. Fill them with resin clay or polymer clay for unique designs. I remember Becky Nunn telling me a long time ago that she didn't consider herself much of a jewelry designer. WELL! As you can see from these examples below, she and her team do a fabulous job with their inspirational designs. The combination of different components is delightful. The bezels, open frames and channel components in particular all provide opportunities to individualize designs. I love how they assembled and photographed all the examples. You can buy Nunn Design components from various jewelry making suppliers or wholesale through Nunn Design itself. Or shop on Amazon for individual items like this Nunn Design Silver Plated Round Channel Bangle Bracelet here . 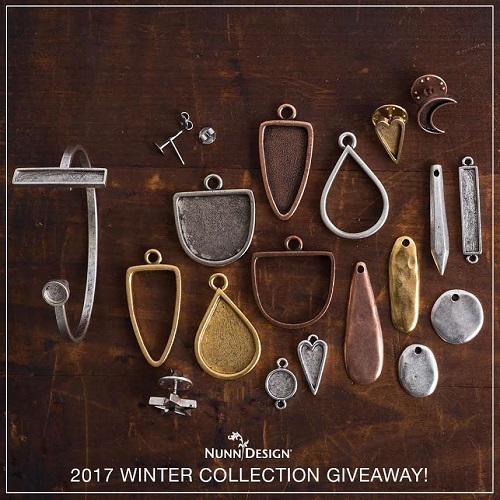 If you'd like to win Nunn Design's 2017 Winter Collection giveaway, please make a comment below. Make sure you leave contact info below if you do not have an online shop or blog. It ends in a week's time at 6 pm EST Monday, January 30, 2017. I will pick the winner randomly and announce the results as soon as possible after. So be sure to leave a contact email if you don't have an online link or make sure you come back and check! Otherwise I will redraw in a week. Good luck! It can be hard finding decent quality bezels for resin jewellery making sometimes! But Nunn designs stuff is all great of course. Would love to try these ones out. Blog follower, subscriber and facebook fan I can be reached at retro-grrl@hotmail.com. Wow! What a way to start the New Year. I want to create away! Thank-you for these beauties. The design ideas are wonderful and have really gotten me thinking! Nunn Design offers such high quality items and these look to be as fabulous as many of the other Nunn Design products I've had fun with already :). I would so love to win this collection. I love the open bezels and well, just everything actually. Wow ! another great giveaway ! I articularly like those frames ... I am a follower , I would like to win ! You're right....Becky & her team continue to outdo themselves with each new collection & their beautiful, inspirational jewelry designs. My mind is already swimming with project ideas. Pearl, as always, a big thank you for all you do for the jewelry community via your blog, Facebook page, Pinterest, & your tutorials. I hope 2017 is a super year for you. I love their little charms and the bangle bracelets. I'm not exactly sure what to do with some of the fantastic Nunn Designs offered but I do love a challenge and opportunity to learn a new skill. I've used Nunn Designs in many of my other pieces and appreciate the quality of their work. Oh Boy, I really want to win the 2017 Winter collection. I love Nunn Designs and many of my best selling pieces are including their Bezels, Bails and components. Thank you for this chance to win Pearl. Wow what an incredible giveaway! Nunn designs are such fun to work with. Thanks for the chance to win some of these great products. Nunn keeps coming up with winning designs. I can see polymer filling those bezels. Beautiful design and quality. Thanks for the chance Prearl. Long time blog subscriber and FB follower. Such a varied collection - would love to win it! I am a blog follower and FB fan! Wow! So beautiful giveaway! I'd like to win... Thanks for chance and greetings! The new bezels look so awesome...would love to get my hands on them to work...and the bangles look super hip.. These are fabulous components! I have ideas for using every one of them! Blog follower, email subscriber & Facebook friend, reach me at cmcoconatgmaildotcom. These are fabulous. Ideas aplenty. ty for the chance to win. I would love to see what I could make with these! blog and Facebook follower. I'd love to give these try. Thanks for adding my name to the list of entries. These new designs look especially fantastic! So much fun, thank you for the chance to win! Great designs. I'm also a subscriber. Oh I really love their collection! I am new to casting resin world (and also to your blog, which is amazing :)) and I realized that is not so easy to find open back bezels, as other jewellery findings. I haven't ever heard about Nunn Design, so I'm glad I have discovered them thanks to your post. And I definitely would like to try their components. Best regards! Ohhhh...so many ideas for so many pretty bezels and drops! I would love to "play" them! Oh gosh the inspiration you shared makes me smile and my fingers and toes wiggle! Beautiful components that offer many possibilities. I am also a blog follower! I have all sorts of ideas that would work with this wonderful, generous giveaway. Thank you for the chance to win. Wow! Beautiful components! I'd LOVE to win these! There is nunn better for inspiration and creativity. I love her findings! Oh what I could make..
Wow lots of creative design opportunities in their new pieces! Thanks Pearl! Oh my gosh! I love all the beautiful ways to create with these gorgeous components. I love this new collection of bezels. These Nunn designs are so versatile and are so adaptable to all kinds of mediums. The bangles are my favorite. What a wonderfully generous giveaway...Thank you! I love the shapes - the possibilities are endless. I would love to play! Oh my! A Nunn Design collection would be awesome! Thank you for the chance to win. I would love to see what I could make with those beautiful findings. Love Nunn Designs. Wow! This is an incredible collection. Who ever wins this one surely has a lot of fun in their future. Was Becky Nunn telling you a joke when she said she didn't consider herself a jewelry designer? Say she was! Becky Nunn has slain us every season with new designs that are nothing but stunning with their simplicity and beauty. Her use of patina on metals that we the common folk can wear is absolutely perfect. Becky's designs are made for the everyday woman and take into account how we as woman like to be diverse. You can tell that Becky is a down-to-earth individual as that is reflected in her designs and what she does with them. I solemnly vow to make Lady Luck something out of Becky Nunn's Winter 2017 Collection if I win! What a fabulous giveaway! I would love to have these! Thank you for the opportunity Pearl! love to win this wonderful giveaway! Neat, neat would love to win these!!!!!!!!!! I would love to win. Nunn items are gorgeous. Ohh ahh! I love all of the ideas in these beautiful photos, and the other posts you linked. So many possibilities! Thanks so much this awesome giveaway! nUNN ALWAYS HAS GOOD PRODUCTS. What pretty, inspirational design ideas!! Would love to try them. Thanks for the chance to win. I am a blog follower. Love your blog!!! Live the chunkyness of these wonderful goodies. I really like the bracelets too. But the whole collection is awesome! Good luck to everyone. Just what the doctor ordered for a mid-winter pick-me-up!! Get busy with all their beautiful pieces and go wild!! Thanks for the opportunity to be able to win. Now I just keep my fingers crossed hoping i do win. The designs are so versatile. I wish I would be the winner. I am your blog subscriber. Some fantastic choices there! Maybe I can finally get over my fear of using polymer clay and dive right in! Can't wait to get my hands on some of these new designs. They are just fabulous! I cannot get enough of design. I want every piece in this collection! I am a new subscriber. I love this entire collection!!! I am especially excited to see the bangle bracelets with the bezel ends!!!!! These new designs are really pretty and inspiring. I have tons of ideas already! I am a follower, would love to win. Love Nunn Designs. I'm inspired to use for polymer clay applications! Great collection. It would be so much fun to win and work with these designs. I do love Nunn Designs! Next best thing? Working with them! WOW SO MANY ENTRIES! GOOD TATSE! WOULD LOVE A CHANCE TOO! TY! JUST AWESOME STUFF! FANtastic product. So needed. Good job! I've always loved Nunn Designs and watch anything I can where Becky Nunn demonstrates using her components in various items of jewelry. How amazing it would be to win this giveaway. I really enjoy your blog. Keep them coming. I am new to using Nunn Designs products by I love them. And I love the new designs. I love these designs thanks for the chance to win them. I would love to win! Im starting to make jewekry, & i know i can be great- if only i can get a little help! I shared on facebook AND liked. What wonderful chance to make something beautiful! These are AWESOME I could make so many beautiful thing if I won. LOVE LOVE LOVE it !! !